Why don’t Italians break long pasta before cooking it? 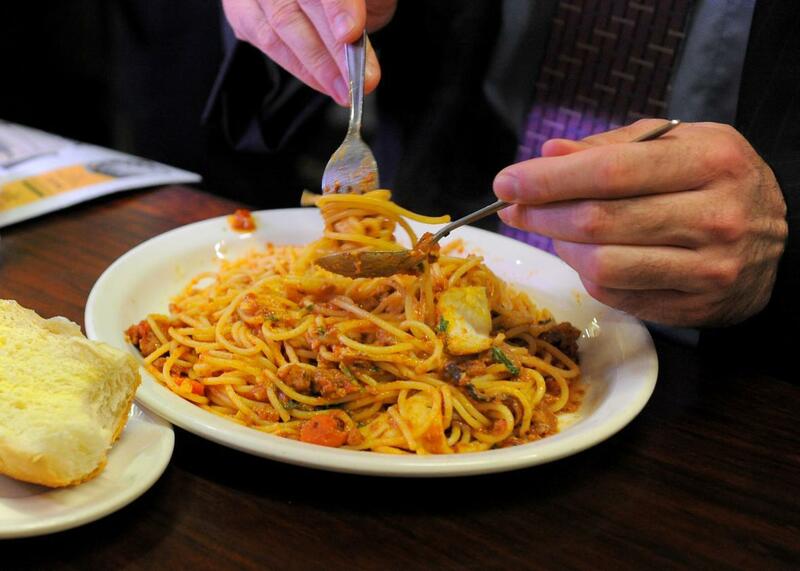 A diner twirls his spaghetti at Pellegrini’s Expresso Bar in Melbourne, Australia, in 2010. There is no physical of chemical change in breaking pasta. It does make it easier to cook, because you don’t have spaghetti sticking out of your pot, but let me explain this from the double viewpoint of being both Italian and a cook. Is it just tradition? Definitely not. Pasta is a big part of Italian cuisine and one of the aspects we’re most proud of (yes, we are aware it was invented in China but won’t admit that to just anyone). And Italian is the most famous cuisine in the world (pizza anyone?). There are hundreds of types of pasta, some of them are made only in tiny villages in the mountains and what not, but spaghetti and other long pasta like linguini and tagliarini are ubiquitous. We all eat them. The reason why you should not break pasta is that it’s supposed to wrap around your fork. That’s how long pasta is supposed to be eaten. You rotate your fork, and it should be long enough to both stick to itself and get entangled in a way that it doesn’t slip off or lets sauce drip from it. The pasta must be cooked right to allow the sauce to stick to it, and the sauce should be thick enough to both stick to the pasta and not drip, splatter, or dribble. In most Asian cultures, noodles are slurped right off the bowl and cut with our teeth. Not in this case. Long pasta needs to be completely secure and rolled around the fork. It’s the least messy way to eat it. If you break your long pasta in half, you’ll have shorter strands that are a pain to be eaten and then you get the people who [shudder] use a knife to eat spaghetti. I guess it could be compared with someone using a fork to impale sushi. It won’t kill anyone, but it’s ugly and, yes, frowned upon. Would you like to watch someone dunk his or her burger patties in boiling water instead of grilling them? No, didn’t think so. If you don’t know how to twirl a fork to eat pasta, just learn it. Lots of people make the effort to learn how to use chopsticks, so why not learn a new way to use a tool that is such a huge part of our lives? Plus, the practice is fun! If you won’t bother, just buy short pasta—penne, farfalle, anything else. You can stab them with your fork and be done with it. Now, an anecdote: My uncle (Italian) is married to a woman (not Italian) who’ll actually cut all of her pasta with a knife before eating it. We can’t stand to watch. My uncle just turns his head to the other side and pretends not to notice. She won’t bother to learn, she’s stated it a dozen times, we all understand, but you can’t make us watch the massacre! I think I’m going to have spaghetti al sugo for lunch now! Italian food: For Italians, what is the most annoying mistake Americans make with Italian food? Pasta: Why would pasta be better if the pasta is added to the sauce, not the sauce added to the pasta? Food: What do you have in your refrigerator that most people do not?